Does having a new brother or sister make you into MORE than you already are? Spencer is about to find out. He's as strong as a bear, as funny as a monkey, and as wild as a tiger. But on one special day, everything changes. Now Spencer is strong, funny, wild, brave, free . . . and gentle, too. 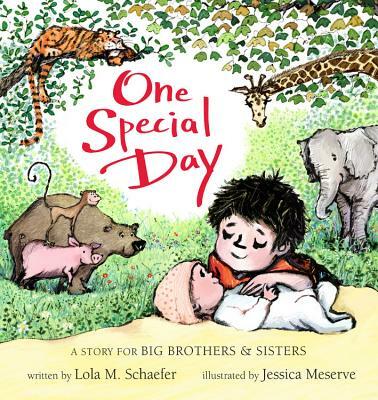 This energetic and heartwarming board book about relishing the joys of individuality and big brotherhood is the perfect gift to celebrate a new sibling. Lola M. Schaefer (www.lolaschaefer.com) is the author of more than 200 books for children, including One Busy Day, the follow-up to this book. Her book Frankie Stein was awarded the Children's Choice Book Award and the Mockingbird Award. Lola lives with her husband, Ted, in the mountains of north Georgia. Jessica Meserve (www.jessicameserve.com) is the author-illustrator of Small Sister and Can Anybody Hear Me? She was born in Maine, studied illustration in Scotland, and worked in publishing as a children's book designer before pursuing a career as an illustrator. Her two young children helped inspire her artwork in this book, as well as its follow-up, One Busy Day.